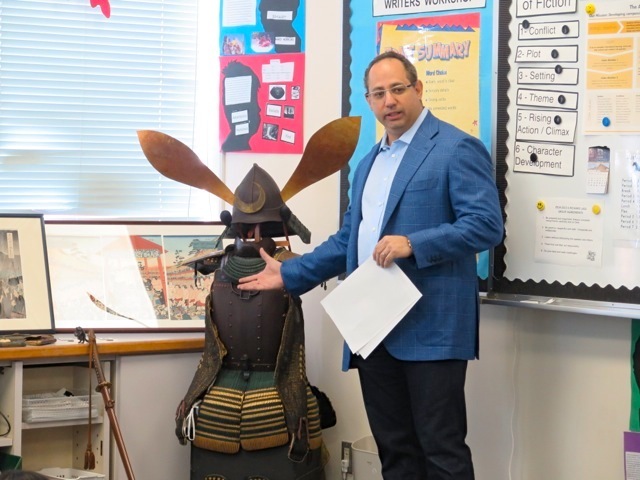 On November 19 we were pleased to welcome ASIJ parent Ryan Goldstein, a collector of Japanese antiques and an expert on the Edo period. Mr. Goldstein gave a presentation to the 6th grade Language Arts/Social Studies classes about what life was like in the Edo period. While introducing different pieces from his collection including a full suit of samurai armor, a katana (sword), tobacco pouches and an ink holder, he explained how to examine them to learn about the people who used these items. It was a great opportunity for students to touch and take a close look at items that are usually behind glass at a museum. Students learned what features tell about the type of family and social ranking of the object’s owner and where they were from. Students were surprised to learn about some Japanese foods and customs we see every day that originated during this period and were considered pretty novel at the time. 6th graders came away with a better understanding of the history and culture of the Edo period. A unique ink holder in the shape of a tanuki (Japanese raccoon dog).